The Deficient Joint Gap, From the series “Inverted Home” 2017, Embroidery and painting on table cover, 119 x 130 cm. The Whispering 2017, Stitching and painting on duvet, Series Absent Demonstration 85 x 105 cm. Series Inverted Home, 2017, Embroidery and painting on curtain, 270 x 133 cm. Exhibition view from Pera Museum, Series Inverted Home 2017, “a good neighbour” 15th Istanbul Biennial. Pediment: Tempetare, Resentful, Nolens volens, From the series “Inverted Home” 2017, Embroidery and painting on bundle fabric, 71 x 67 cm. Absent Demonstration, 2016, Embroidery and painting on natural dyed fabric, 116 x 146 cm. Ripper –Rooter 2015, embroidery and painting on duvet, 90 x 81 cm. The Trap, 2015, Stitching and painting on duvet; Series Absent Demonstration 52 x 103 cm. 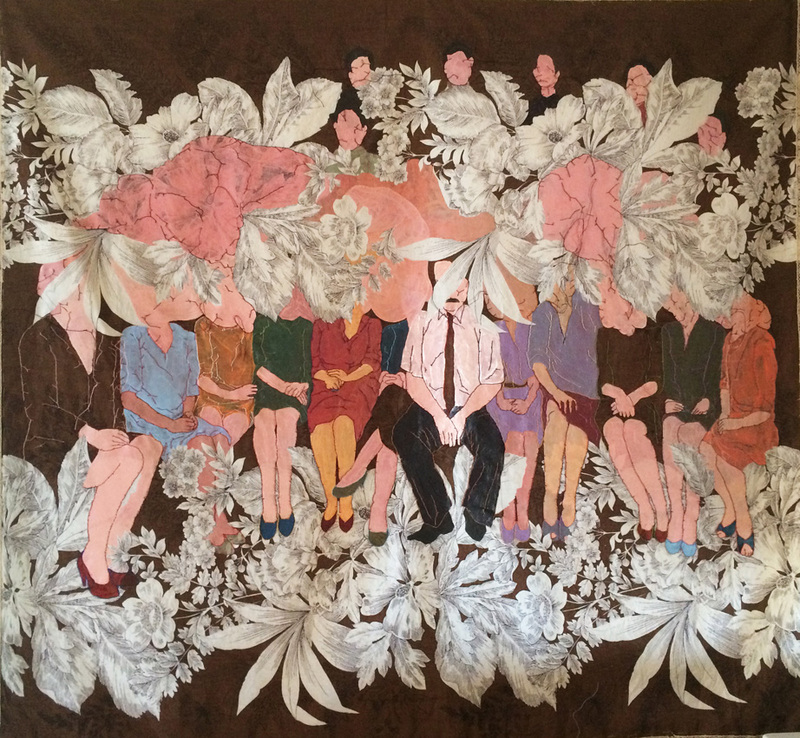 Diplomacy, From series Rehearsal, 2014, Embroidery and painting on fabric,147 x 206 cm. Boys eat Turkish Delight, From the series “Please c­lear the dance floor!” 2010, Embroidery and painting on piece of curtain, 34 x 25 cm. At-Home Day, From the series “Please Clear the Dance Floor!” 2009, Embroidery and painting on bundle fabric, 62 x 62 cm. Special Passport, 2009, Embroidery on fabric, 14.5 x 9.5 cm (original dimensions) 22 pages.